Neon & LED Truck Lights for that "Added" Glow! Complement every feature of your truck or SUV by using led truck lights - Set your ride apart from the competition. Nowdays, under truck lights are more durable and draw much less power than neon lights do, and the tubes are made of water-resistant, high impact acrylic. LED truck lights are used for high-lighting both internally and externally, and can be applied to any vehicle for an enhanced appearance. These highly durable accents tubes last longer than other lighting kits, they have instant on/off capability with multi control for various modes and speeds and add luminosity and enhanced appearance to your vehicle. LED lights for trucks can be mounted to dashboards, Under your Truck/SUV, cupholders, windshield wiper, taillights, fluid sprayers, seat and door edges, wheel wells, and countless other locations. 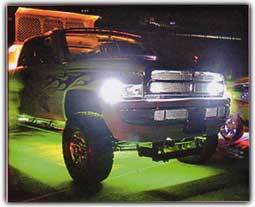 LED truck lights can provide one solid color to your vehicle, or flashing, chasing color. They are available in undercar or truck lighting kits, LED screw lighting, accent interior lighting, and more. We use only the highest quality LED Truck lights on the market today and they will all work fine with any 12 volt electrical system. 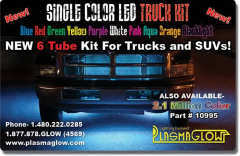 PlasmaGlow provides exceptional led lights for trucks, and all complete with a lifetime warranty. 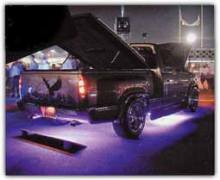 There are also many Neon Lighting products that will go on your Truck or SUV - Choices, choices, don't you luv em? 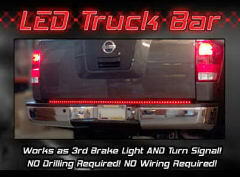 Accentuate your Truck or SUV with the following LED truck lights. The 2.1 Million Color changing LED Truck SUV Kit has 4x 38" tubes to cover the area between the cab and the rear wheels, and 2x 50" tubes for the front and rear of the truck or SUV. Order this kit Today and receive a Bonus car lighting Gift valued at $20-$50 Absolutely FREE. But Hurry! This week only. Do you have a car, truck or SUV that doe's not have enough room under the body to mount thick, straight neon or LED tubes? If so, then the flexible LED undercar kit is for you. The LED tubes are only 1/4" thick, can be bent around corners and can be used for virtually any 12v application. Order this kit Today and receive a Bonus car lighting Gift valued at $20-$50 Absolutely FREE. But Hurry! On Special! Hurry! Stocks will NOT LAST! The 12v Remote Control Wireless Commander is the only way to wirelessly control any 12 Volt products from up to 500 ft away. It features 3 wireless zones so you can control your 12v accessories separately from a distance. $139.00USD On Special! - STOCKS WILL NOT LAST! This LED Brake Light for Trucks & SUV's features a simple installation that requires no drilling or wiring and has 5 display modes: running lights, brake, left and right turn signals and reverse lights. Give your Trucks rear a new sharp look. $169.00USD for one 60" Bar. Order either of these kits Today and receive a Bonus car lighting Gift valued at $20-$50 Absolutely FREE. But Hurry! This week only. This LED Brake Light for Trucks & SUV's features a simple installation that requires no drilling or wiring and has 4 display modes: running lights, brake, left signal and right signal. $149.00USD for one 60" Bar. 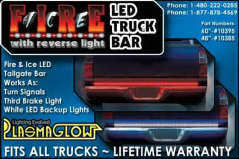 Light up the rear of your truck bed with tough, BRIGHT LED lights. Light up ANY compact space with brilliant color like never before! - Includes 10 feet and 10 LED Modules. 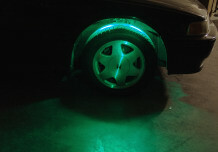 The color changing LED wheel well kit will create light where its never shined before! Be sure to check with your State Road Laws in regards to having under truck lighting on your Vehicle.